The CeDEM13 call promised “networking, great keynotes, good food” (see www.donau-uni.ac.at/cedem). And we delivered: the CeDEM13 presented keynotes by Beth Noveck, Karine Nahon, John Carlo Bertot and Tiago Peixoto. 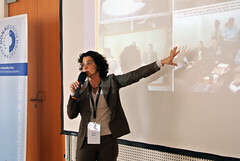 Presenters and attendees came from 23 countries, allowing for interesting converstations and networking opportuniteis. And the food? Well, the social dinner was a delicious success, held at the Late Brasserie overlooking the Danube. So this was CeDEM13. But we still have a little bit more on offer. You need more? Yes, of course. This is the overview to the 2,5 CeDEM13 days (CeDEM13 program_final.pdf). If you want to know more about CeDEM13, and the relevant content use the tag cedem13. The CeDEM13 proceedings will soon be available online (OA) as a pdf, and in book format by the end of summer. We will let you know – so come back! It was a pleasure meeting you all in Krems, and we hope you enjoyed the CeDEM13 conference! Are you interested in CeDEM14? CeDEM14 will be held 21-23 May 2014 in Krems – more details to be found on our website www.donau-uni.ac.at/cedem stay tuned via Twitter or sign up for our newsletter. If you can’t make it then, join us for the CeDEM-Asia in autumn 2014 in Hong Kong (dates to be announced). * JeDEM Open Access E-Journal: Call for Papers – submit a paper of your work until 17th June 2013. Focus of the next issue: Transformation of Citizenship and Governance – special Asia focus. For more inforamtion please contact us here. 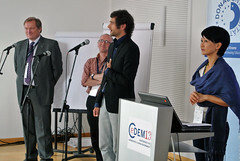 find more pictures in our CeDEM13 flickr album.. Among Nahon’s research interests are information flows, natural gate keeping and inequalities in cultural technologies. She is also co-author of the book “Going Viral” and on several boards striving to make information more transparency. Karine Nahons keynote begins with film of the protests in Israel in July 2011 agaisnt the regime. Are these protests the result of facebook? No the “success” of protests (up to 500,000 protesters) was due to the use of news paltforms. Open Research means open access to reasearch data and papers. Michaela Vignoli shows the need to develop a new research culture that reflects current research work: distributed teams, digitised content, e-infrastructures, computer aided search and processing of data, online cooperation (“e-reserach”). Open research is therefore a response to the developing research culture. The universites in Austria have adopted the “green” OA path.